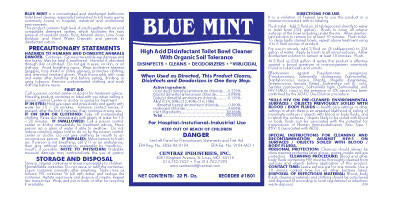 Bowl & Waste Treatment – Centraz Industries Inc.
Blue Mint is an EPA Registered, acid-based toilet bowl disinfectant specially formulated to kill many germs commonly found in hospital, industrial, and institutional environments. Porcelain Tile & Bowl is a ready-to-use thick all-purpose phosphoric acid bathroom cleaner. 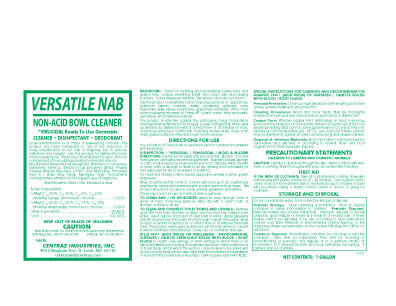 Versatile NAB is an EPA registered non-acid bowl cleaner that kills odor-causing bacteria and leaves everything bright and clean! Power Bowl is a high acid toilet bowl cleaner that removes scale, rust, calcium deposits, and other discolorations. It can also be used on boat hulls to remove barnacles and slime on both metal and fiberglass. Always rinse after using. Johnny Brite is a non-fuming, fast-acting acid toilet bowl cleaner. It quickly removes soap, scale, calcium deposits, rust, and other discolorations. Honey Bowl is a thickened HCL bowl cleaner with the inviting fragrance of Cherry Almond. Shower Care is excellent for removing rust, calcium deposits, and other discolorations from bathtubs, wash basins, shower stalls, drinking fountains, stainless steel, toilet bowls, urinals, and other surfaces. Drain Care is a professional-strength liquid drain opener that will not harm most iron, ABS, CPVC, PVC, or clay pipes. Main Event is a non-fuming, extra-powerful drain cleaner that removes obstructions and blockages due to grease, rags, matches, paper, hair, and most other organic matter. 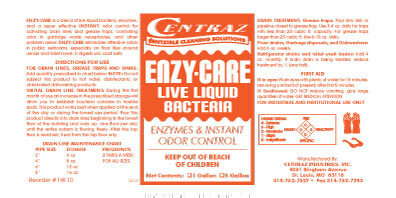 Enzy-Care is a blend of live liquid bacteria and enzymes. Extremely effective for cleaning drain lines and grease traps, it also instantly controls odor in garbage/waste receptacles and other problem areas. Micro Bac is a blended product containing bacteria cultures, surfactants, perfume, and opacifying agents. It is formulated for use in routine sewer and drain maintenance. 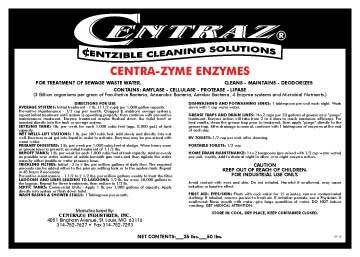 Centra-Zymes is a superior system of powdered bacteria cultures designed for drain cleaning, sewage treatment, grease digestion, municipal installations, and industrial environments. It is biodegradable. 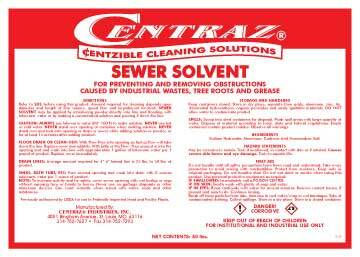 Sewer Solvent is a granular sewer blockage disintegrator. It is safe for use on clay pipe, cast iron, and ABS drain pipe.